I chatted with a bunch of folks of Facebook Live today. It was great fun and there were lots of great questions. If you missed it, here’s a record of the event. Danny, I enjoyed this after the fact while I was at work (looking incredibly busy). I liked hearing what was coming up for SBS and seeing your place. This is alone, the internet is a wonderful thing! Thanks for sharing the recording– I was having a leisurely weekend away at a B&B (sigh), so couldn’t listen live. 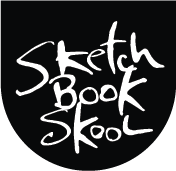 It’s cool to hear what you guys have planned for Sketchbook Skool, and fun to hear about your art and life. I’m sure it feels all weird and one-sided on your end doing these video chats, but on my end it feels friendly and welcoming. I just got your workbook in the mail– I had thought I didn’t really need to buy it, since I have the Art Before Breakfast book and thought it might just be redundant, but your videos where you’ve worked in the workbook got me hooked. A good combination of fun and practical. I don’t have a good daily habit for art right now (I’m pretty sporadic) so I think this will be helpful. Thanks! I did not listen live. I actually don’t really like podcast like stuff but have learned that for me, they work when I listen and draw at the same time. So perhaps I will try that more often and it will be a win/win for me…inspiration while producing.